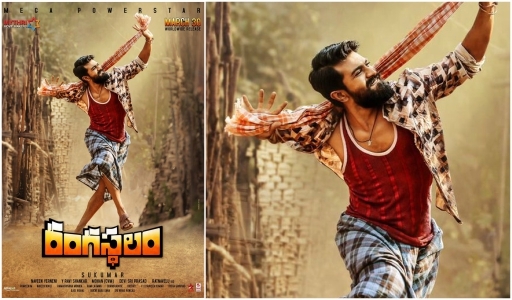 Ram Charan, in the first look poser of ‘Rangasthalam’, is seen in a buoyant mood and the pose that he strikes in the poster seems to be a dance step from a song in the film. Mega Power Star Ram Charan’s much awaited ‘Rangasthalam’ is currently talk of the town because of the look he will be seen sporting in the film and the distinct feature his character has in the film. It is being said that Ram Charan will be seen playing a rustic character since it is set in a rural backdrop and also the film is a period drama. The buzz around the film is too huge and fans of the Mega Power Star have been waiting to get a glimpse of some aspect about the film. And much to the joy of the fans, makers of ‘Rangasthalam’ have now released the first look of Ram Charan from the film which has now become the focal point in Telugu film circles. Ram Charan, in the first look poser of ‘Rangasthalam’, is seen in a buoyant mood and the pose that he strikes in the poster seems to be a dance step from a song in the film. What catches the attention in the poster is the look that Ram Charan sports – a countrified rustic look with a beard – that suits his aptly. The makers have also confirmed that ‘Rangasthalam’ will hit the screens worldwide on March 30th, 2018 creating huge buzz around the film. ‘Rangasthalam’ is being directed by Sukumar and also stars Samantha Akkineni in the other lead role. ‘Rangasthalam’ is being produced by Mythri Movie Makers and has music composed by Rockstar Devi Sri Prasad. ‘Rangasthalam’ will also star popular Telugu TV host and actress Anasuya Bharadwaj in a pivotal role. Besides this interesting cast, ‘Rangasthalam’ will also have a special number that will have ‘Duvvada Jagannadham’ actress Pooja Hegde shake a leg alongside Mega Power Star Ram Charan. Reports are emerging in the film circles afresh regarding the character of Ram Charan in Rangasthalam. Rumours are rife that the actor is essaying the character of an engine driver who would be a disabled person. According to these rumour mills, Ram Charan will play a hearing-impaired person in Rangasthalam. There were rumours earlier that Samantha Ruth Prabhu, who plays the female lead role in the film, would be playing the role of a visually-impaired character. But the production house has lashed at all these rumours and said that she would be playing a normal character. Actor Aadi Pinisetty will be playing Ram Charan’s brother in the film and, as in Allu Arjun’s Sarrainodu, will be playing the baddie in this one too. Interestingly, ‘Rangasthalam’ will release along with ‘Mahanati’ which is a biopic on yesteryear iconic actress Savitri. ‘Mahanati’ has Keerthy Suresh playing the role Savitri while Dulquer Salmaan will be seen playing Gemini Ganesan in the biopic. It will be interesting to see how these two films will compete and fare at the box office in March 2018. And just a week later after these two films’ release, Allu Arjun’s ‘Naa Peru Surya’ will also be hitting the screens worldwide. With such a packed schedule, summer of 2018 will surely be an exciting season for fans of Telugu cinema. Besides ‘Rangasthalam’, ‘Mahanati’ and ‘Naa Peru Surya’, another big project is also slated to be released around the same time which is Mahesh Babu’s ‘Bharath Ane Nenu’. Directed by Siva Koratala, ‘Bharath Ane Nenu’ will have Mahesh Babu playing a full-time politician, a role which he has tried his hands in his career so far. ‘Rangasthalam’, ‘Mahanati’, ‘Naa Peru Surya’ and ‘Bharath Ane Nenu’ will be the biggest projects that will be lined up in summer of 2018. Producers of these four films will be quite kicked about the released and will also be pensive about the box office numbers of their respective films. So, which film out of these four do you think will emerge as the winner? Let us know in the comments box below.